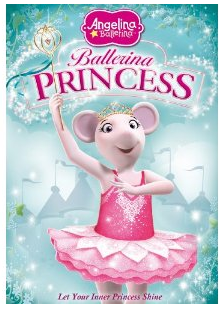 Lionsgate and HIT Entertainment have come out with Angelina Ballerina: Ballerina Princess DVD ! Combining the words "Ballerina" and "Princess" is a great idea...my daughter was all over it! All 5 episodes are fun and if your a Angelina fan you won't be disappointed. I love these shows because my daughter prances around the house all day after watching. And she loves the songs and of course the dancing. Join Angelina Ballerina and her friends for enchanting adventures filled with princesses, princes, kings and queens. Dancing their way through Chipping Cheddar, Angelina encounters a bad fairy, uncovers a Cinderella-like mystery, treats the king and queen to a regal performance and brings an epic tale to life on stage! With secrets, spells, dance and celebrations, it's a royally good time for all! One reader will win a Angelina Ballerina: Ballerina Princess DVD! US only If you have previously won this dvd in another giveaway, you are not eligible. I was given the above dvd to review from Lionsgate and HIT Entertainment. My daughter would like this! my neice would love this. My twin granddaughters would love this DVD. My niece would love this movie! My niece would love this. kristiedonelson(at)gmail(dot)com Thank you. my daughter loves Angelina. thanks for the giveaway! My daughter would love this dvd. Thanks so much for the chance! My daughter just got into ballet and such.. she would absolutely adore this!! great giveaway! my daughter would love this! Thanks for the chance to win this DVD!